HAMPTON, Va. (Nov 7, 2018) — Hampton University rising senior, Leondra Head, recently published her first book entitled, Walking In Your Path, a self-help novel encouraging young adult students and young adults to follow their passions. CINCINNATI (Nov 29, 2017) – The Scripps Howard Awards, one of the nation’s most prestigious journalism competitions, will accept entries from Dec. 1 to Feb. 2. Hampton University’s Scripps Howard School of Journalism and Communications celebrates its 15th annual “Scripps Day” Oct. 25, commemorating its longtime partnership with The Scripps Howard Foundation. The Scripps Howard Foundation is launching a year-long postgraduate fellowship program designed for individuals who aspire to journalism leadership positions in the media industry. Hampton University Scripps Howard School of Journalism and Communications Monday received $150,000 to install a cutting-edge content management system. The system will integrate all aspects of production, provide hardware and software and fuel the school’s creation of a wide range of multi-platform digital programming. Super Bowl LI in Houston, at 6:30 p.m. EST on Fox. Hampton University is preparing for its annual Martin Luther King Jr. holiday celebration on Monday, Jan 16. Students and faculty plan to participate in a campus-wide march beginning at 10 a.m. at the Emancipation Oak and end it at Ogden Hall. Following the march, there will be a program to honor King’s legacy at 11 a.m.
As part of the challenge, HU students presented a video of their work to the Ford Motor Company in Michigan. Hampton University President Dr. William R. Harvey has called a press conference for noon, Friday Nov. 18th to discuss the University’s commitment to yield “not one inch” of campus property for the Virginia Department of Transportation’s proposed expansion of Interstate 64. As part of its plan to add a third tunnel tube to the Hampton Roads Bridge Tunnel, VDOT proposes to acquire Hampton University property to widen I-64 from four to six lanes. The President and CEO of the National Geographic Society, Gary Knell, will visit the Hampton University campus April 20-21, 2016. The visit will kick off with the CEO’s keynote speech at the William R. Harvey Leadership Institute (WRHLI) Graduation Ceremony in McGrew Towers, April 20 at 6 pm. Then will conclude with a meet and greet offering the opportunity to gain invaluable insight from one of the industry's top performers. The Scripps Howard School of Journalism and Communications (SHSJC) is again making its mark with the launch of BRAND757, Hampton University's first, student-run PR and brand agency in the university's nearly 150-year history. Hampton, Va. – The Hampton University Scripps Howard School of Journalism & Communications welcomes fashion business writer Teri Agins during the live taping of The Caldwell Café on Wed., March 18, 2015 at 6 p.m. in the Scripps Howard TV studio. CNBC, first in business worldwide, recently announced the introduction of the CNBC Summer Fellowship Program in partnership with Hampton University's Scripps Howard School of Journalism & Communications as well as the Missouri School of Journalism and New York University. The Hampton University Scripps Howard School of Journalism and Communications welcomes national news anchor Bernard Shaw during the live taping of The Caldwell Café on Thursday, November 13 at 6:15pm in the Scripps Howard television studio on campus. Essence Magazine's Ed Lewis will visit the Scripps Howard School of Journalism and Communications on Wednesday, Nov. 5, 2014 at p.m. in the school's television studio. 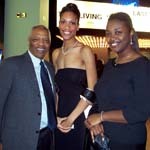 Lewis will be the highlight of the School's television show "The Caldwell Café," hosted by Prof. Earl Caldwell. Students, faculty and the community are welcome to attend the production. Lewis will be promoting his new book, "The Man from Essence: Creating a Magazine for Black Women." He will hold a book signing immediately following the show. 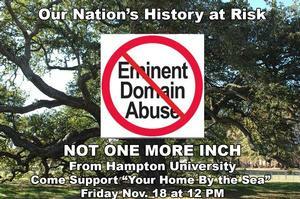 Hampton, Va. (October 17, 2014) - Hampton University will be hosting its 12th annual Scripps Day on October 20, 2014. This year's theme is "Media Innovation and Change." This event will serve as a platform for students to network with media professionals and receive valuable information about the evolving media landscape. It will also provide information about internships and job opportunities. Professors at Scripps Howard Create "Big Hair Obsessions"
What happens when a women is so attached to her hair style that she hides from friends, won't go to work or class, spends enormous amounts of money on products, is afraid to let her significant other see her natural hair or even let it be seen in public? On Tuesday, Oct. 7, The Associated Press Sports Editors (APSE) will joing Scripps Howard's School of Journalism and Communications once again for the Day of Diversity program. The October issue of Virginia Living magazine has named Hampton University on its list of the state's "Top High Schools & Colleges 2014." Scripps Howard assistant professor Van Dora Williams, who has produced PBS documentaries on African-American history, reconciliation, and social and environmental issues, will have one of her projects airing nationally on cable television this fall. Scripps Howard associate professor Wayne Dawkins has published a review of "African Americans in Mass Communications: A Reader." The review of the book appears in the September 2014 issue of American Journalism, a quarterly journal of the American Journalism Historians Association. Hampton University senior Kathryn Kenny has been selected to participate in the New York Times Student Journalism Institute. Kenny was one of two Hampton University Students to be selected to participate in the 2014 summer institute, which will be held from May 18 to June 1, 2014 at Dillard University in New Orleans. Tommie Collins, an English and graphic design double major from Chicago, also received this prestigious recognition. Scripps Howard's Brandon "Theo" Dorsey won a coveted nine-day trip to Japan to study journalism along with eight other winners of the annual Roy W. Howard National Collegiate Reporting Competition, sponsored by The Scripps Howard Foundation. The junior broadcast journalism major from Houston, Texas, embarks on the all-expense-paid trip Thursday, May 8. American Legacy magazine's "Know Your History" mobile museum will park in front of Hampton University's Scripps Howard School on Wednesday, Feb. 19, providing a rare opportunity for students, faculty, and visitors to tour the national exhibit of African-American artifacts, memorabilia, photos and interactive learning stations. The exhibit is free and will be open from 9 a.m. to 5 p.m.
Shola Lynch, the mastermind behind the film "Unbought & Unbossed" about Shirley Chisolm, the trailblazing black congresswoman and first major-party, African-American woman to run for president of the United States, will appear on the next segment of The Caldwell Café. Lynch's second documentary, "Free Angela & All Political Prisoners," highlights the dramatic story and life of the former political prisoner. On Tuesday, Nov. 5, a seminar featuring entertainment industry professionals will be held at the Scripps Howard School of Journalism and Communications at 6:30 p.m. in room 139. Speaking at the event will be Norfolk-native Roosevelt Harrell III, who has previously worked with Roc-A-Fella Records recording artists, and Hampton alum and producer Matt White from "Overnight" on 95.7 radio. When it comes to fighting breast cancer, there's rarely much to smile about - until now. This year, to help gain a better understanding of breast cancer, The Public Relations Student Society of America (PRSSA) proposes a new breast cancer awareness event called "Ask Me About My Bra" to be held on Wednesday, Oct. 30, 2013, at 5 p.m. in the Robert P. Scripps Auditorium. 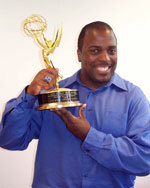 Kenneth Walker will be featured on The Caldwell Café television series on Wednesday, Oct. 16, 2013 at 2 p.m. in the television studio at the Scripps Howard School of Journalism and Communications at Hampton University. Walker will be Professor Earl Caldwell's guest, as he answers questions about his emergence covering Jessie Jackson' 1984 presidential campaign and his ascension to the very top of his field. Looking for an internship in preparation for a career in journalism and communications? Representatives from prominent media companies—including the New York Times Institute, Bloomberg, CBS, Google and the Scripps Howard Foundation—will visit the Scripps Howard School of Journalism and Communications in the coming weeks to give students a “heads up” about their internships. This is a rare opportunity to learn firsthand from media professionals the skills that media companies are looking for in new graduates, to discuss the internship process and for students to have their burning career-related questions answers. Hampton University alum will also be present to discuss their experiences and life/work after college. Do not miss this chance to network and be a stand out! Hope Dreams NBA referee Tony Brothers turns "Hoop Dreams" into "Hope Dreams"
Hampton, Virginia: (Sept. 12, 2013) – Norfolk native and veteran NBA official, Tony Brothers, inspires through his foundation Still Hope. Still Hope Foundation Inc. assists single mothers in building successful family unity by offering resources and support to build strong relationships. Entertainer extraordinaire Beyoncé beat the Super Bowl XLVII advertisements and the football game in the 4th Annual Super Bowl Best and Worst Survey by the Scripps Howard School of Journalism and Communications (SHSJC) public relations students at Hampton University. On Wednesday, Feb. 13, the Scripps Howard School of Journalism and Communications will present a live taping of The Caldwell Café featuring special guest and author, My Haley. On Sunday, Jan. 27, Pulitzer Prize-winning journalist and author of the New York Times’ Bestseller, The Warmth of Other Suns, Isabel Wilkerson will be the guest speaker at the 120th Annual Founder’s Day Ceremony. At the fifth annual Day of Diversity at Hampton University on Wednesday, Nov. 14, members of the Associated Press Sports Editors (APSE) will share with students the many ways that today's news is delivered on multimedia platforms that move beyond the print medium. Hampton University’s Scripps Howard School of Journalism and Communications is pleased to announce the formation of a new board of advisors comprised of some of the most influential leaders in the global media and entertainment industries. Wayne Dawkins, assistant professor of Journalism at the Scripps Howard School of Journalism and Communications, has authored the first biography of an unforgettable African-American journalist and activist, Andrew W. Cooper. The biography, titled "City Son: Andrew W. Cooper's Impact on Modern-Day Brooklyn," possesses sound facts and tantalizing tid-bits. The Scripps Howard School of Journalism and Communications (SHSJC) at Hampton University announced that two of its students have been awarded scholarships from Y&R advertising, and named the first "Y&R Scholars." "A Public Relations Panel Discussion on Breaking Into the Fashion Industry"
On Friday, April 20, the Hampton University chapter of the Public Relations Student Society of America (PRSSA) has partnered with the "Black Reign: HU Rips the Runway" to present the first public relations fashion panel "Breaking Into the Fashion Industry." On Wednesday, April 18, the Scripps Howard School of Journalism and Communications will have its final presentation of The Caldwell Café series for the 2011-2012 academic school year. The guest speaker will be Emmy award-winning television news anchor Jim Vance. Ken Baker, a chief news correspondent for E! Entertainment, will speak with students via Skype at the Scripps Howard School of Journalism and Communications on Thursday, April 12 at 2 p.m. in the R. P. Scripps Auditorium. The Scripps Howard School of Journalism and Communications Principles of Advertising class (JAC 230) will host Mr. Neil Onsdorff, Account Director at BBDO, on Thursday, April 12 at 2 p.m. in room 139, as part of the Inside Advertising Speakers Program of the Advertising Educational Foundation (AEF). Over 3,000 high school students and their parents will visit the campus for the 34th Annual High School Day on Friday, April 6. The event is being coordinated by the Office of Admission to allow prospective high school students the opportunity to experience and explore a day in the collegiate life of a "Hamptonian". Scripps Howard alumni will return to the Scripps Howard School of Journalism and Communications' Robert P. Scripps Auditorium on Wednesday, March 14 at 6:30 p.m. for another session of the renowned "Hampton Alumni" Caldwell Café. Hampton University’s Scripps Howard School of Journalism and Communications (SHSJC), leading producer of African–American journalism and communications graduates, announced today that four of its seniors have been chosen to participate in the 20th Annual NABJ Multi–Media Short Course. The program will take place from Wednesday, March 21 to Saturday, March 24 on the campus of North Carolina A&T State University in Greensboro, N.C.
Hampton University’s Scripps Howard School of Journalism and Communications (SHSJC) announced today that representatives from ESPN will visit SHSJC as well as other university departments on Thursday, February 23. ESPN executives will meet with business, sports management and journalism and communications students to talk about internship and career opportunities with the organization. Prominent entrepreneur and author, Stacy Milner, owner of Executive Temps, a renowned entertainment industry employment agency and author of "Leveraging Up! The Key To Launching Your Entertainment Career," will speak in the Robert P. Scripps Auditorium on Thurs., Feb. 9, 2012 at 5 p.m. at the Scripps Howard School of Journalism and Communications. Milner will conduct an Entertainment Career Seminar––a dynamic presentation that will provide a behind-the-scenes look at what it takes to land a job and succeed in a career in the entertainment industry. Scripps Networks Interactive, known for its lifestyle media specializing in programming focused on food, home, entertainment, and travel, will hold career sessions on Monday, Feb. 6 and Tuesday, Feb. 7 at the Scripps Howard School of Journalism and Communications (SHSJC). Hampton University’s Scripps Howard School of Journalism and Communications have put their motto to use once again. In a time where job opportunities are scarce, Scripps Howard will be a lighthouse to its students at their 8th annual Scripps Career Day event on Wed., Jan. 25. Freshman and broadcast journalism/prelaw major Lezla Alease Gooden has been awarded the highly coveted Emma L. Bowen Foundation Scholarship for Minority Interests in the Media. The Emma L. Bowen Foundation was established in 1989 to assist minority students interested in pursuing careers in media. Journalism Professor to Tell Epic Story of Brooklyn’s "City Son"
Assistant Professor Wayne Dawkins completed "City Son: Andrew W. Cooper’s Impact on Modern-Day Brooklyn." The book will be published in July 2012 by University Press of Mississippi. Dawkins worked six years on this biography of his mentor Cooper [1927-2002] who was the mastermind of a successful voting rights lawsuit that made Shirley Chisholm’s historic election to Congress possible. Scripps Howard School majors filled the R.P. Scripps Auditorium and were engaged from start to finish. Students asked questions and offered opinions. It may have been the subject matter: NFL quarterback Michael Vick, who was a high school football start in Newport News, Va. Daily Press president and publisher Digby Solomon gave students candid comments about the future of the newspaper industry. On Wed., Nov. 30, international photographer Ross Taylor will meet with students at the Scripps Howard School of Journalism and Communications (SHSJC). Taylor, a Virginian-Pilot staff photographer, will discuss highlights of his career and offer advice to students interested in photography and photojournalism. Hampton University President Dr. William R. Harvey has announced that Brett Pulley has been named dean of the HU Scripps Howard School of Journalism and Communications. Pulley’s appointment is effective January 1, 2012. On Wed., Nov. 9, Caldwell Café will host Belva Davis, an award-winning journalist who has covered politics for four decades. Davis will speak and answer questions in the auditorium at the Scripps Howard School of Journalism and Communications at 6:30 p.m. She was the first African-American woman hired to work on television in the western United States and is profiled in the NEWSEUM, the world’s first interactive museum of news. The APSE (Associated Press Sports Editors), in its fourth year of visiting the Scripps Howard School of Journalism and Communications for a Day of Diversity, will be at the school on Wed., Nov. 9 from 10 a.m. to 4 p.m. This will be the third consecutive year that the Sports Journalism Institute has partnered with the program. A select group of Hampton University journalism majors will work alongside 24 aspiring NASCAR drivers representing 10 states, Mexico and Puerto Rico who will showcase their skills at Langley Speedway, as part of the Eighth Annual NASCAR Drive for Diversity Combine, Oct. 18-20. The journalism students will simulate a “media coverage experience” as part of media training for all the drivers. World-renowned public relations consultant and attorney Judy Smith, founder and President of Impact Strategies, will discuss her stellar career of representing high profile corporate, entertainment, international, political and sports clients, as part of a lecture series at the Scripps Howard School of Journalism and Communications at Hampton University on Wednesday, Oct. 19. Impact Strategies is a leading strategic and crisis communications firm with offices in Los Angeles and Washington, D.C. The Scripps Howard School of Journalism and Communications will welcome the T-Howard Foundation on Thurs., Oct. 13, 2011, 5 to 6 p.m. in room 148. The Foundation partners with major companies across the United States, offering internships in the multimedia industry to minority students. It is a new year with new beginnings at the Scripps Howard School of Journalism and Communications. The school is welcoming new professors and new courses to broaden the multimedia skills of the Scripps Howard students. The Hampton University Scripps Howard School of Journalism and Communications (SHSJC) will welcome its alumni to the annual convention and career fair of the National Association of Black Journalists (NABJ) during a reception on Thursday, Aug. 4, 2011. The reception will be held at the Pennsylvania Convention Center, 1101 Arch Street, in Philadelphia, Pa.
On Wed., April 20, Caldwell Café will host Erika Salter, a Scripps Howard School Alumnae and Executive Producer of Salter Entertainment Group. Salter will speak to SHSJC students at 6:30 p.m. about her career and answer questions regarding the multimedia industry. J.J. Green, National Security Correspondent at WTOP 103.5 FM in Washington, D.C., will visit the Scripps Howard School of Journalism and Communications on Thursday, April 14. Green will speak to students about his coverage of events in the Middle East and his career in journalism. More than 50 Scripps Howard students and faculty will embark on a day trip to Washington, D.C. on Wed., March 30 to visit Capitol Hill, the National Geographic Society, CBS News, Voice of America and BET Networks for the school’s annual “Media Day.” The trip will allow students the chance to gain exposure to various media environments and leaders. The Martin Agency, an award-winning advertising agency headquartered in Richmond, Va., will visit Hampton University's Scripps Howard School of Journalism and Communications on Tues., March 15. Danny Robinson, senior vice president, creative director and Hampton alum, and Dr. Lauren Tucker, director of consumer forensics, will answer questions and speak to students about the advertising industry. In celebration of Black History Month, Caldwell Café will welcome Joel Dreyfuss of theRoot.com to Hampton University’s Scripps Howard School of Journalism and Communications on Wednesday, Feb. 23 at 6:30 p.m. Dreyfuss is the managing editor at the Root. ESPN executives will visit the Scripps Howard School of Journalism and Communications, as well as other select University departments and classes for ESPN Day on Fri., Feb. 18 to educate students about the station's internship and career opportunities. Jay Harris, a SportsCenter anchor and Norfolk native, will also be in attendance. The HU Department of Health Physical Education and Recreation (HPER) is hosting the event. Chris Torres and Chaunte'l Powell have been selected by the Associated Press Sports Editors (APSE) to participate in a summer 2011 internship program. Torres, a senior print journalism major from Atlantic City, will be working at the Palm Beach Post in Palm Beach, Fl. Powell, a junior print journalism major from Columbia, South Carolina, will be working at the Asbury Park Press in Asbury Park, NJ. Hampton University’s Scripps Howard School of Journalism and Communications (SHSJC), the leading producer of top-notch communications professionals, announced today its 7th annual Scripps Career Days event to take place from Wednesday, Jan. 26 through Thursday, Jan. 27. Aptly themed ‘Getting Down to Business,’ representatives from the Scripps Howard Foundation, E. W. Scripps Co. and the Semester in Washington Program have scheduled over 75 interviews with rising sophomores, juniors and seniors. Award-winning author and actress Denise Nicholas was welcomed by a full house on Wed., Jan. 19 at Caldwell Café, an event hosted by Hampton University's Scripps Howard School of Journalism and Communications. Nicholas discussed her writing and acting career, in addition to her participation in the civil rights movement. Stephanie Sutton, Scripps Howard School of Journalism and Communications (SHSJC) Class of '08, fondly recalls spending many late evenings at the school working on projects for hours with "amazingly creative people." She laughs, "Nowadays, [the projects] would take me only an hour or so to finish." For the third year in a row, APSE will visit the Scripps Howard School of Journalism and Communications for a Day of Diversity. The Hampton University Scripps Howard School of Journalism and Communications & The Philadelphia Inquirer/Daily News and the Philadelphia Association of Black Journalists present the i-Mixer. The Scripps Howard School of Journalism and Communications at Hampton University and CBS News are holding an informational mixer for prospective high school students and their families Monday, Nov. 1 from 6 p.m. until 7:30 p.m. The Scripps Howard School of Journalism and Communications at Hampton University was awarded $40,000 from the Dominion Foundation. The Higher Educational Partnership grant award will support a multimedia energy project that will involve the creation of student-produced journalism and public relations awareness campaigns designed to educate the public about issues related to natural resource exploration, energy transportation and storage, power generation and energy delivery, renewable power projects and energy conservation efforts in the Hampton Roads region. Joi Troutman, a Scripps Howard School of Journalism and Communications (SHSJC) Class of 2010 graduate, has been hired as a Client Executive with Burson-Marsteller, LLC - a premier public relations and communications firm with offices located worldwide. Our majors are spending their summer at various organizations across the country working in media-related internships. They will spend at least 150 hours enhancing their editing, writing, and reporting skills while building their portfolios with work samples and creative projects. An AEJMC Newspaper Division selection committee has named Rick Kenney of Hampton University the division's 2010 winner of the Outstanding Teacher Award. A former journalist with the Baltimore Evening Sun, Pittsburgh Post-Gazette, St. Petersburg Times, South Florida Sun-Sentinel and other papers, Kenney was named Scripps Howard Endowed Professor of Journalism at the Hampton, Va., university last year. Congratulations to Mavis Baah, broadcast journalism senior and Jared Council, print journalism senior, for the Hampton University's President's Award recognition during Honors Day, March 20. Shannon Epps, a senior journalism major in the Scripps Howard School of Journalism and Communications at Hampton University, has been awarded the top scholarship for copy editing among all the nation's college students. Fatima Bodrick, a Scripps Howard School junior public relations and Spanish double major from Fairfield, OH, is currently studying abroad south of the border in San Jose, Costa Rica for the Spring 2010 semester through the American Institute for Foreign Study (AIFS). For the last 40 years, AIFS has been one of the most respected cultural exchange organizations in the world. Junior print journalism major Shemar Woods from Centreville, Va. has been accepted into the Sports Journalism Institute (SJI) Class of 2010. He will participate in weeklong training at the Poynter Institute in St. Petersburg, Fla., before traveling to complete an eight-week internship in sports writing at The Denver Post, Colorado’s largest daily newspaper. Woods was selected on the basis of his academic achievement, interest in sports journalism as a career and his essay submission. Ofield Dukes, APR is scheduled to speak during this month's Caldwell Café, Wednesday, Feb. 17, at 6 p.m. in the Scripps Howard School of Journalism and Communications. In 1969 Dukes started his own public relations firm, Ofield Dukes and Associates, that is among the most successful public relations firms in the Nation's Capital, with specialized expertise in minority affairs, particularly African-American, African, and political affairs. To emphasize the importance of multimedia, students and media professionals participating in the annual Scripps Career Days at the Scripps Howard School of Journalism and Communications have created an online Scripps Days site and a YouTube site to showcase the event in text, photos and video. The tightening of the job market as a result of the recession is not preventing recruiters from looking for students from the Scripps Howard School of Journalism and Communications at Hampton University. Twelve representatives from The E.W. Scripps Company will visit the Scripps Howard School this week Wednesday and Thursday to offer more than $100,000 in career opportunities to Hampton University students. Raven Pratt, a junior broadcast journalism major, will submit two entries on Hampton University's response to the H1N1 crisis to the Hearst Journalism Awards Program. Pratt has been following the student reactions to the H1N1 crisis and how the university responded. Shalisa Smith, graduating senior public relations major and spanish minor, has received honorable mention for the Public Relations Society of America Multicultural Affairs Scholarship. The scholarship exists to recognize outstanding academic achievement and commitment to the practice of public relations. The public relations senior capstone class in the Scripps Howard School of Journalism and Communications helped students save seven lives each by signing on the dotted line. The class, taught by Dr. Francis McDonald, APR, partnered with LifeNet Health to host "Resurrect 12-2 While Saving Lives," an organ and tissue donor registration drive Dec. 4 in the HU Student Center Atrium. The Association for Practical and Professional Ethics (APPE) has selected Jared Council, a Scripps Howard School senior print journalism major, to present at its nineteenth annual conference. His essay entitled, "Fox News: An Indefensible Ethical Error," was accepted in the undergraduate category of the conference to be held March 4-7 in Cincinnati, OH. Yaniel Sargeant, a junior Public Relations major from Montclair, NJ is currently studying abroad in Cape Town, South Africa for the Fall 2009 semester. She is taking classes at the University of Cape Town, studying Media, Power and Culture and Social and Economic Development, among other classes. Shannon Epps, a senior print journalism major from Smithfield, Va., has been awarded an internship for summer 2010 with The Washington Post, working on its universal news desk. Hampton University’s Scripps Howard School of Journalism and Communications will partner with LifeNet Health to host "Resurrect 12-2 While Saving Lives," an organ and tissue registration drive on Dec. 4 from 10 a.m. – 2 p.m. in the Student Center Atrium. On a cloudy, rainy day in Hampton, Va. this month, Associated Press Sports Editors brought the bright lights to Hampton University's Scripps Howard School of Journalism and Communications. A handful of sports journalism's most accomplished professionals gathered, hoping to pass along advice on the ever-changing multimedia world. Earl Caldwell, a visiting professor at Hampton University’s Scripps Howard School of Journalism and Communications, will be inducted into the National Association of Black Journalists (NABJ) Hall of Fame at the organization’s 2009 Annual Convention held Aug. 5-9 in Tampa, Fla. Caldwell will be recognized on Aug. 7 at 11 a.m. at the Tampa Convention Center. Tony Brown has announced his retirement as the first dean of Hampton University’s Scripps Howard School of Journalism and Communications at the end of the academic year. Brown will remain in his current role as president of Tony Brown Productions, Inc. in New York City and as a featured speaker across the nation. He also plans to complete his fourth book and remain active in promoting the need for English fluency. Hampton University's Scripps Howard School of Journalism and Communications will welcome director and producer Shola Lynch to discuss her film "Chisholm '72: Unbought and Unbossed" on April 22 at 6:30 p.m. Lynch's visit is a part of the School's Caldwell Café series and will be held at the Scripps Howard Auditorium. A new partnership between the Scripps Howard School at Hampton University and Young & Rubicam Brands will kick off with two days of marketing and communications immersion sessions on April 7 and 9 for journalism and communications majors.Young & Rubicam Brands is a global, collaborative network comprised of some of the most powerful brands in marketing communications.